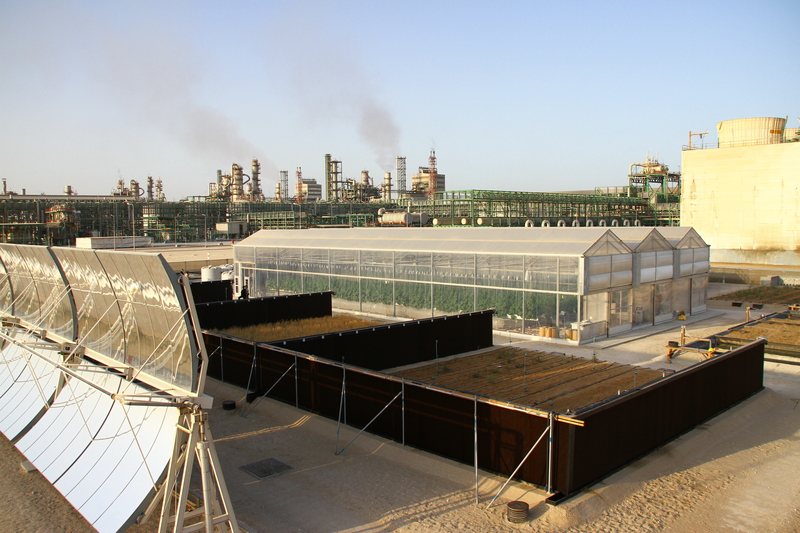 The Sahara Forest Project facility in Qatar uses seawater and sunlight to produce vegetables, energy, fresh water, desert plants, animal feed and salt. Photo by Elsa Naumann/Sahara Forest Project. Reporters Jonathan Miller, Sam Eaton and Mary Kay Magistad have been in Mexico, Costa Rica, India, Singapore, China, Qatar, Uganda and the Netherlands gathering tape for a series of radio and TV stories about the future of food in a climate-changed world. Topics will include alternatives to meat, alternative staples, GMOs, traditional seeds, foraging, vertical farming, agroecology, aquaponics, aquaculture, carbon-neutral farming and agrobiodiversity. Oh, and low-carbon cafeteria meals. The series, part of the “Food for 9 Billion” project, will air on PRI’s The World and PBS NewsHour beginning in June. For updates, follow the project (and look for the #Foodfor9Billion hashtag) on Twitter.